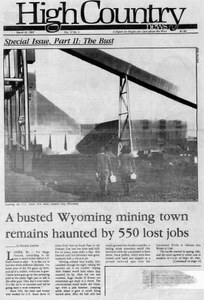 In Part 2 of a two-issue series on boom and bust in Wyoming, Lander is still reeling from U.S. Steel's decision last April to permanently close its Atlantic City iron ore mine. Lander, Wyo., is still reeling from U.S. Steel's decision last April to permanently close its Atlantic City iron ore mine. Although U.S. Steel denies it, the firm is shutting down the immense Geneva mill step by step, even as it wrings millions in profits out of it and the workers it plans to layoff. The Department of Energy has run into stiff opposition to its plans for siting the nation's first high-level nuclear waste dump at the Davis and Lavender Canyon sites a mile from Canyonlands National Park.